Of course, that would be news to Jesus, who seems to have a lot to say about money in the Gospels. The truth is that the way we use our treasures on earth reveals where our treasure really lies. 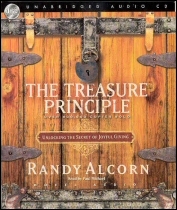 So this week we’ll be giving away a free copy of Randy Alcorn’s The Treasure Principle. Just post a comment admitting that you do in fact think about money, and we’ll select a winner at random next week. Congratulations to Larry Jacobs, the first Free Stuff Friday winner (chosen by the always equitable “pick a number between 1 and 10” method). 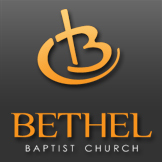 Larry, make sure you see me at church to claim your prize, So High the Price, by the Steve Pettit Evangelistic Team. 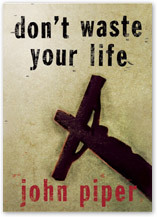 This week, we’ll be giving away a copy of one of our favorite books, Don’t Waste Your Life, by John Piper. Consider this story from the February 1998 Reader’s Digest: A couple ‘took early retirement from their jobs in the Northeast five years ago when he was 59 and she was 51. Now they live in Punta Gorda, Florida, where they cruise on their 30-foot trawler, play softball and collect shells . . .’ Picture them before Christ at the great day of judgment: ‘Look, Lord. See my shells.’ That is a tragedy. Don’t Waste Your Life is a message we all need to hear. So…if you want to win a copy of this invaluable book, comment on this post and give a helpful way to “unwaste” your life–for example–waking up an hour early in order to spend time in the Word, or skipping that Sunday afternoon nap in order to help in the bus ministry. A winner will be chosen at random next Friday morning, so don’t worry if you’re not Louis L’Amour. Just say something! And it’s not even the day after Thanksgiving! What will we be giving away? A new car? A year’s supply of random delicious foods? We’ll see, we’ll see. 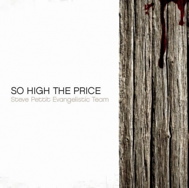 This week, one lucky person will win a shiny new copy of So High the Price, a new CD from the Steve Pettit Evangelistic Team. 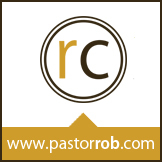 Here’s how to win: Comment on this post, describing something that was a blessing to you during our Praise Emphasis Week (January 24-31). At the end of next week, we’ll choose a winner at random and announce it here on the blog. Make sure you comment by next Thursday evening to be entered into the drawing. The winner will be chosen at random, so don’t worry about making your comment a Pulitzer-prize winning composition. We’re looking forward to reading your comments!